Winter is so cold that we have to wear heavily to keep warm. But for some women, they are always stylish and beautiful no matter the season is summer or winter. Three items cannot be neglected for any beautiful ladies: hat, scarf, and glasses! Hats and scarves are used to keep warm, and the glasses used to decorate our faces. The wine red is especially suitable for winter, giving people a feeling of calmness, chic and modernity. These burgundy glasses are cat-eye glasses, handmade, and attractive in quality and appearance. With a set of burgundy clothes, it is also more suitable for shopping, dating or taking pictures. This yellow dress gives a very clean, elegant and quiet feeling. If you are an office worker or a student, it must be a good fit! The plaid scarf is paired with leopard-print glasses, which are unique and attractive. 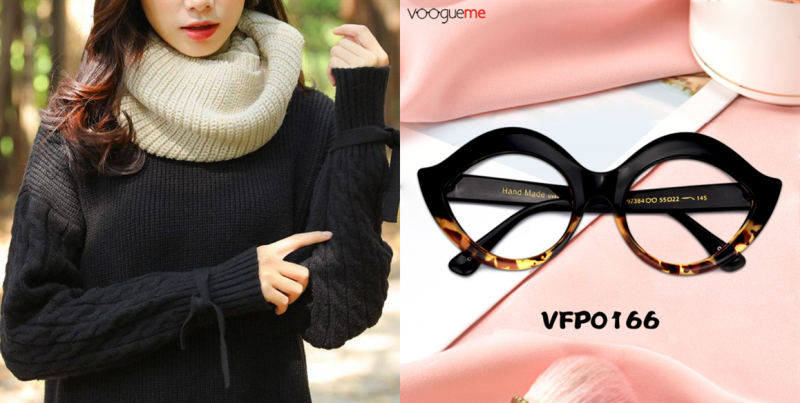 This spectacle has always been very popular, and its texture and design are suitable for city women. The looming feeling adds to the mystery, and it is definitely the "male killer"! This black spectacle has a unique and sharp design that will have a cool feel. The cotton texture of the scarf gives a comfortable feel, while the design of the glasses will add a sense of workplace fashion, which is very suitable for attending meetings or dressing out. This collocation is full of young and lovely feelings. There is the leopard print on the bottom rim of the glasses, which also gives a warm, naughty feel. This set is perfect for young women. If you are going out to go shopping or date someone you like, then this cute and unique pair of glasses is absolutely necessary! This is the most suitable set that I like, and it looks very clean and gives a very mysterious and dignified feeling. The material of the wood and acetate will also give a reliable feeling. Pairs of white glasses and clean clothes look very cultural. If you are a very lady, this must be for you! The houndstooth scarf and the big square glasses are a perfect match! Houndstooth is the present of fashion designers, and the leopard frame is also a favorite of women. When they are combined, it will be very popular. It's warm and stylish, you really shouldn't miss it. It is very suitable for wearing when you have a meal! The color of orange always gives a very warm feeling, especially in this cold winter. These glasses have been sought after by everyone, and she is very unique. When you wear them, you feel that your face is getting smaller. This pair of glasses is also very suitable for travel in the spring, it is very cute and exquisite. Let's spend this cold winter together! I hope you can have the most beautiful glasses, the most fashionable collocation, and then go out on a date!